Chic and elegant crystal bridal necklace set studded with clear crystals on a sparkly silver finish - necklace has an adjustable chain and earrings measure approx 3.5cm long. An amazing contemporary design that is hand-crafted with chunky round Genuine Austrian Rhinestones on sterling-silver plate. This set lays beautifully on the neckline, as the drop pendant gives it just the right amount of drama. The center design measures 4 3/4 inches wide with the drop at 1 ½ inches. The necklace measures 14 to 17 inches and can be adjusted with the attached extender chain for just the right fit. The stunning matching earrings measure just over 1 1/4 inches long. 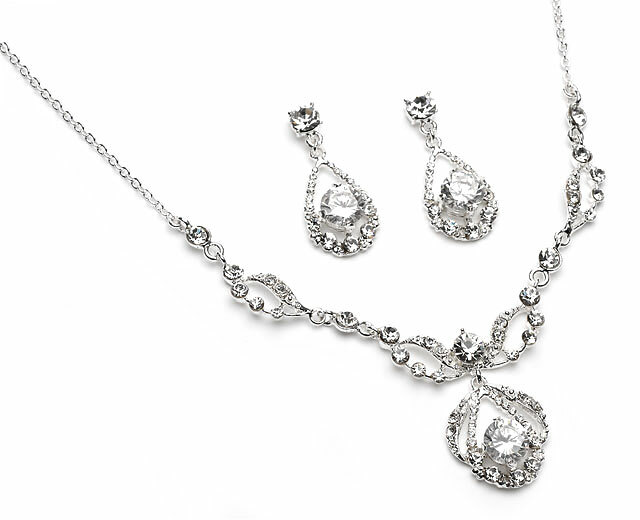 Pure Sparkle Wedding Jewelry set coordinates with any color wedding dress or formal gown.